So many birds and so little time... How do you know which bird feeder and food to buy? 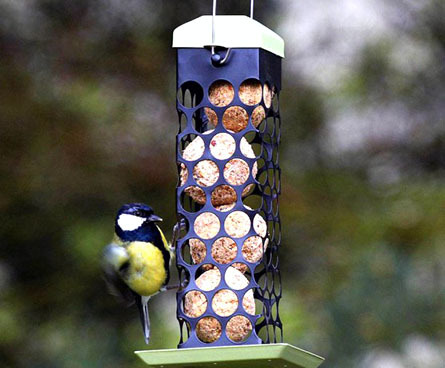 Why choose a suet feeder? Because birds everywhere are attracted to suet and it's so fun to watch birds (like these mockingbirds) at your feeder. Suet feeders attract a variety of birds, and and they are not always the same birds you see at your bird seed feeder. 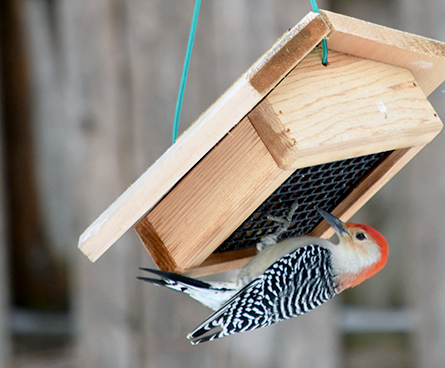 Suet feeders complement your existing seed feeders and attract woodpeckers and other suet-loving birds — that's why every bird lover should learn more about suet feeders. Many people get into bird watching not just for one bird, but because they like to see lots of birds flying around and visiting their yard. If you aren't looking to attract a specific bird, you have lots of choices. Our recommendation is simple: start with a suet feeder. Suet feeders attract a wide variety of birds, are easy to use, and are great for first-time birders. What kind of birds does a suet feeder attract? Suet feeders attract a diverse group of birds and since suet feeders come in different shapes and sizes, you can even get suet feeders with special features (for example, suet feeders for birds like woodpeckers that eat while clinging upside down, or window feeders that allow you to watch titmice eat up close). Jays: Blue jays are beautiful but often misunderstood birds. Their stunning colors often mask their intelligence, and these smart birds will come back to a suet feeder time and time again (often battling for food with a neighborhood woodpecker - which is a sight to see). Chickadees: Best known for their "chick-a-dee-dee-dee" song, these vocal songbirds are friendly and will be frequent visitors to a suet or seed feeder. Just keep your suet feeder filled and these energetic birds with return often. Titmice: Titmice can be found in most parts of the United States and, unlike many other types of birds, will store up food for winter. When seeds and suet are mixed together in a suet cake, the titmice get an extra burst of energy from the suet. Warblers: These songbirds can be hard to attract with bird seed, so suet gives you the best chance at watching warblers up close. If you are lucky, you might even be surprised to find one of the endangered species of warblers eating at your suet feeder. 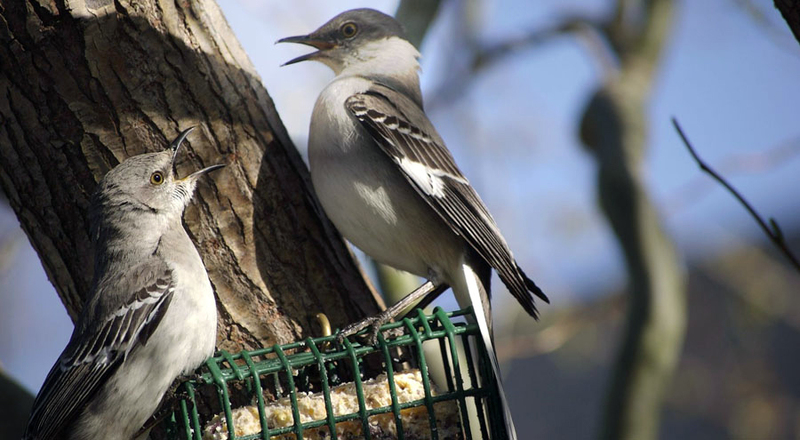 Mockingbirds Few songbirds are as enthusiastic as mockingbirds, and these vocal visitors to your yard can be tempted to eat at a feeder with berry-filled suet. Woodpeckers: Suet feeders are the best way to attract woodpeckers. If you haven't seen a red-bellied woodpecker land on a suet feeder, or watched a tiny downy woodpecker break off a big piece of suet for its nestling, you are in for a real treat! Nuthatches: Able to climb up and down trees head-first, nuthatches are easy to identify at backyard bird feeders. While they will also eat at seed feeders, nuthatches are equally comfortable clinging upside down on a suet feeder to get to the good bird food. Easy to use: Suet feeders use suet balls, blocks or cake to store the bird food. These solid blocks of bird food are easy to add to a suet feeder, and simple to store in your home or garage. Suet takes up much less room than bird seed. 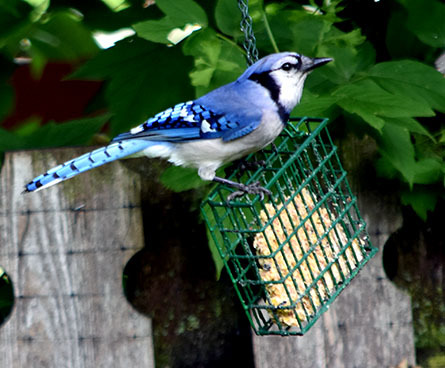 Stays where you put it: Suet is much more efficient than seed alone because the seed doesn't fall to the ground easily. It sticks to its form in the suet feeder until a hungry bird pecks some off food to eat. Less waste: Refilling a bird feeder should be easy (and ideally not done daily). An ambitious squirrel won't tip over your suet feeder and spill all of the food. Minimal bird food is wasted with suet and suet feeders, saving you time and money in the long run. Low maintenance: You won't be cleaning up sunflower seeds or weeding under your suet feeder because of dropped food. Suet stays in the bird feeder where it belongs (until it gets almost entirely eaten up by birds and needs to be replaced). Squirrel baffles and low-mess feeding cups can help reduce the amount of bird seed that is lost at bird seed feeders, but if you start with a suet feeder you can avoid that at the beginning and add seed feeders as you go. Want to attract different birds? If you got into bird watching because you love seeing bright cardinals sitting on your evergreen branches in winter, you'll choose a cardinal feeder and sunflower seeds. 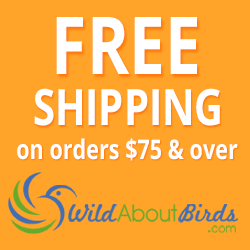 If their burst of yellow color makes goldfinches your favorite, you'll want to choose a finch feeder and thistle. You may have a favorite bird you want to attract. If that's the case, see if your favorite bird is on our list too! We have tips and pictures that help you learn more about the birds you want to attract. Seed feeders may attract a wider variety of birds, but suet feeders have a place in every yard because they are easy to use and easy to clean up. Plus they come in some great designs and attract birds you just won't see at a bird seed feeder. If you haven't checked out the latest suet feeders, you might be missing out. 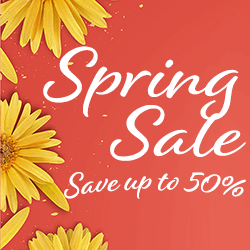 Photo Credit: Mockingbird by jodier / 123RF Stock Photo. Blue jay and woodpecker photos by WildAboutBirds.com photographer Judy_NMMI.